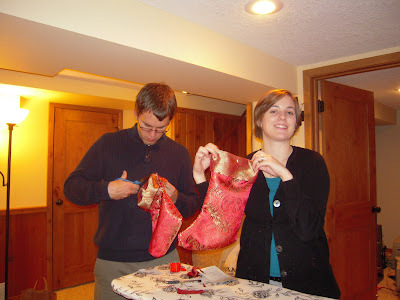 Well, I mentioned that I would post about the process of making our Christmas stockings, so here goes. I have to extend my gratitude to LaureLaura for helping me with my first sewing project! Needless to say, I'm quite proud of myself; I think they turned out great! After finding the perfect fabric, LaureLaura sent me a pattern, which I doubled, cut out, pinned to my fabric, and trimmed around. I made sure that the pattern was aligned the correct way, and that I had two sides facing left, and two facing right, so they would fit together as a stocking. I also cut out a five-inch strip to create the cuff. After ironing everything and pinning the stocking sides together I was ready to sew. Eeek!!! So scary! I had never used one before I made my stockings, so learning how to use it was quite scary (but straightforward once LaureLaura explained it all to me). So, I learned how to thread the bobbin and the needle, adjust the little foot that keeps the fabric in place, and calibrate the pressure my foot put on the pedal (just like driving a car...). Now it was time for the tricky part: The cuff. 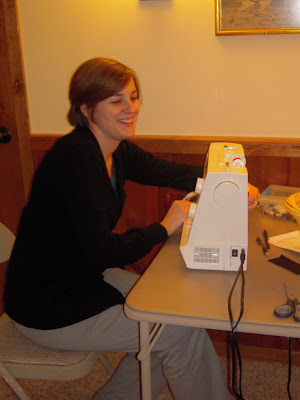 Laurelaura helped me iron and sew the five-inch pieces I cut out earlier into a tube. We then pinned the cuffs onto the stockings, and I attached them by sewing into the inside of the stocking, moving in a circle as I pushed the whole thing through the sewing machine. It was pretty difficult, but my stitch wavered in only a few places. 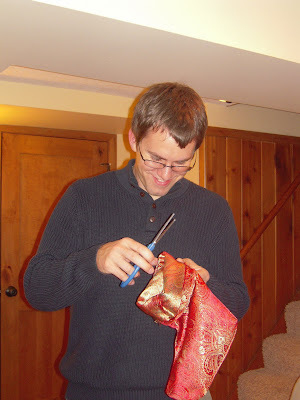 ...and the hubs trimmed the strings from the hem inside the stocking. Voila! New, handmade stockings for our first Christmas together! Thanks, Laurelaura!